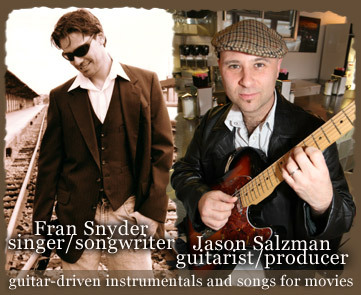 Sign up for Broadjam today to follow Fran Snyder and Jason Salzman Productions, and be notified when they upload new stuff or update their news! 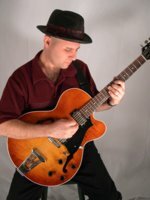 Jason Salzman and Fran Snyder, two unique songwriter-performers, create a wide variety of music that tastes like honey and sticks like glue. Fran Snyder is a critically acclaimed singer-songwriter. Remaining fiercely independent for a decade, he has sold thousands of CDs, performing clubs, colleges, and halls. Jason Salzman cut his teeth playing in pits for broadway-style productions and rocking out in front of huge crowds with successful touring rock acts. They both have extensive recording, writing, and performance credits. In 2006, they are making their extensive catalogue available to for synchronization and licensing purposes. In this abbreviated list, you'll find acoustic pop, modern rock, unique children's music, as well as bed clips of hip-hop, R&B and bossa nova. Please inquire if you'd like a custom track created especially for your project. Their combined experience makes your choices limitless.